The Korg Volca Mix is a portable analogue performance mixer that for many is the final link in the chain for your volca setup. Combine multiple Volca units over four channels to create mixes that will excite thanks to the onboard signal processing designed to elevate your sound. As with all of the units in the Volca range, Korg have managed to squeeze plenty of exciting features into a compact chassis with the Volca Mix. Onboard you'll find crisp-sounding LO/HI CUT filters and an impressive master chain that can be used to radically alter the sound. Synchronisation is a breeze and there's also DC output connectors that can feed power to three volca units from the included PSU. The chssis is constructed from high-quality aluminium panels, just like you would expect to find on a high end DJ Mixer. At the heart of the Volca Mix is a four-channel anaolog mixer, thanks to an intuitive design the layout combines with connectivity to take control of your Volca units. There are two mono inputs and one stereo input which are perfect for connecting three Volcas. Connection is a breeze, simply feed the signal from the headphone out of your volca units to the inputs via the supplied mini jack cables and operation is just as simple - use the vertical faders for precise control over levels. Adjust balance in the mix by boosting gain, each channel features a mute button as well as LO/HI CUT filtration with single knob control. You'll quickly sculpt your sound as the natural-sounding filters give you complete control over the character imparted on your sound. The connectivity on offer isn't limited to just the input stage, RCA stereo line ouputs provide a stable connection and the LED VU meter provides a clear visual indication of master volume. If you need to monitor your mix on stage the headphone output can be used simultaneously with the master line out. There are also speakers built-in which can be switched off if required. Although compact, these speakers are capable of delivering SPL levels greater than the built-in capabilities of the Volca units themselves. Despite its size and price, Korg didn't cut corners when designing the master effects section. All analog circuitry delivers an expander to broaden a mono source into a stereo image and there's also a dynamic range compressor that compresses the high frequency range according to changes in level at the low end frequency. Of course no dance music master chain is complete without the capability to use sidechaining and here the Volca Mix excels - you can truly use the effects to breath life into your mix adding a professional feel. If you'd like to use additional effects there is also send and return functionality (using stereo mini-jack our and AUX in jack) with control for send levels per channel, a nice touch in a unit of this size. Tempo sync is also possible using an anolog sync output which is easily connected to many other pieces of kit in Korg's extensive product line up. Unlocks even more potential from the Volca range. AC adapter, DC-DC cables, and audio cables included. 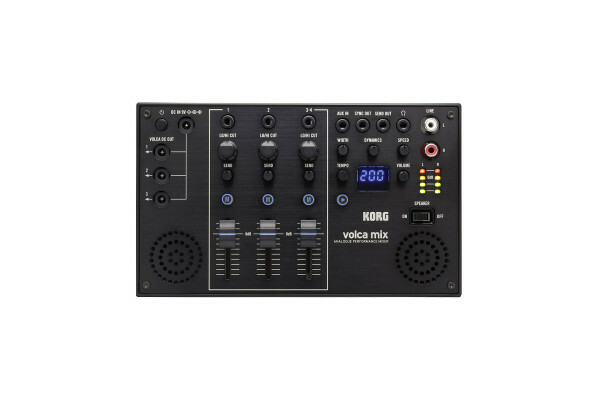 Seen the Korg Volca Mix Analogue Performance Mixer from another UK Dealer Cheaper?